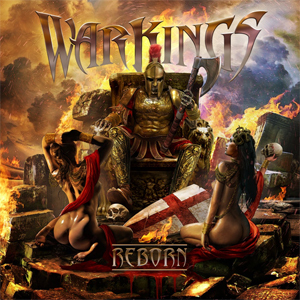 WARKINGS Release Second Glorious Single "Hephaistos"
It's the Spartan who raises his voice and guides you in the ancient years of Greece. He came to praise Hephaistos, the fire god, responsible for all the metalworking which made the Greek get the best weapons and the most beautiful jewelry you could imagine. He is a symbol of power, as the Spartan and the WARKINGS are! The Spartan: "This is for the god of fire, the blacksmith of the pantheon. We met, we drank...and then we forged this anthem!" Watch the official lyric video for "Hephaistos" below. The glorious WARKINGS just unleashed "Hephaistos"! "Hephaistos" is a glorious glimpse of what you mortal beings will get, when the debut album Reborn will be released on November 16th. Recorded inside the endless halls of Valhalla, produced by Odin himself and mixed and mastered by our forefathers, who died honorably by the sword, this track will crush you all! On Odin's order, the WARKINGS will leave their sanctuary behind to return to the European battlefields! It will be an historical moment, when the four ancient warriors set their foot on the ground in Vienna after an absence for many centuries or even millenniums on December 8th!